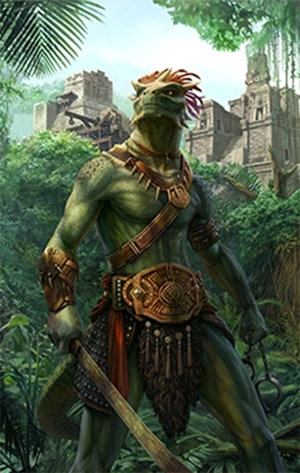 What I would actually like to discuss today is the center of the Argonian religion and mythology: The Hist. It’s hard to tell sometimes if the Hist is an actual god-like presence or if it is mythology built up by the Argonians. Maybe it’s both. So if you’re ready for a drug-induced trip into the core of Argonian culture, keep reading. But if you’re not ready for what has to be the weirdest trip into Elder Scrolls lore, you might want to turn back now. It’s a bit difficult to really explain what the Hist are from a metaphysical perspective, but physically, they are trees. Obviously, they are special trees that seem to communicate telepathically with each other, but more on that later. The trunks of the Hist are unusually fat, and they are usually depicted standing on their roots. Some say that this is because is because the Hist actually move from place to place, but there are no recorded instances of a hist actually doing that. The branches of the Hist are very thin when compared to the trunk, and the leaves usually grow only from the tips of the branches. This gives the trees a bestial look, as if they could at any moment start chasing you and grab you with their hand-like branches. The Hist aren’t Ents, however. Unlike the walking, talking trees from Lord of the Rings, these trees neither walk nor talk. In fact, if you’re not Argonian, you’ll likely not hear the Hist communicate at all. Even Argonians hatched outside of Black Marsh will not hear the Hist’s words. According to Argonians, the Hist communicate with each other telepathically over great distances. They say the trees share a hive mind, and most Argonians say they can hear its whispers. But those who don’t have Argonian blood cannot hear the voice of the Hist, even if they participate in the same rituals. The leaves those who are not Argonian very skeptical about whether the trees are sentient or the Argonians are just participating in some sort of shared illusion. I’m not going encourage anyone to walk up to a strange tree and lick its sap, but that’s what Argonians encourage their people to do. According to Argonian culture, when a young Argonian ingests the sap of a Hist tree, it connects him or her to the Hist and hive mind of their creators. When a young Argonian drinks the sap of the Hist, it determines its growth patterns and its gender. The Argonians often experience visions when taking the sap. And most hold these visions as very sacred. For those who aren’t Argonian, ingesting enough sap will kill them. However, in small doses, non-Argonians will experience hallucinations. Many of the other races consider it a prized ingredient because of these properties. Argonian communication with the Hist is subject to debate, but it’s clear that only the Argonians who ingest the sap believe in the full power and deity of the Hist. For these Argonians the Hist gives them their names, their guidance, and even their mate. 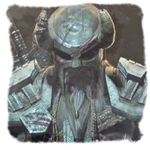 But that is all speculative because many Argonians experience all of that without influence from the Hist as well. Perhaps it’s not the same place as the one reserved for child molesters and people who talk at the theater, but the Hist have a special place in Oblivion, too. According to the Elder Scrolls novel The Infernal City, there are Hist trees that occupy a city called Umbriel with their own humanoids and their own hive mind. It possible that this is the origin of the Hist in Tamriel, but there is no direct evidence of that. It’s more widely believed that the Umbriel Hist are rogue. The Argonians in Tamriel believe that the Hist comes from the Void, or rather they were created by the Void, which ties the Argonians directly with the Dark Brotherhood. In fact, the Dark Brotherhood has a special name for Argonians in their midst: Shadowscales. There are also Hist trees in Clavicus Vile’s realm of Oblivion, but there is no origin story for them. It’s unclear where the Hist originated from, and we are like never going to find out. But according to Argonian history, the Hist used to be everywhere on Mundus. Because of the secret nature of the Hist, it’s unclear why the Hist are now mostly reserved to Black Marsh. Some say it was the Ehlnofey wars of the Dawn Era. Other evidence points to Dwemer using the trees for wood, but there are not strong accounts for either. In the Murkmire DLC coming later this year (after Wolfhunter), we get to spend some time in Black Marsh. We skirted the edges in Shadowfen, but supposedly we will dive in deep into the Argonian culture. This is uncharted territory for the Elder Scrolls franchise. We’ve never been here before. And the writing team gets a chance to really make something interesting. Let’s look at the material they have to work with. A species of deity that — for the first time — isn’t Daedra. We have a culture that is vastly underdeveloped. And we have a religion that is based on the visions generated by psychedelics. So there is an opportunity to juxtapose reality with mystical, drug-induced illusions. Elder Scrolls Online has done a terrific job now of living up to the legacy of the former Elder Scrolls games, but now I think it’s time for ESO to make its own memorable mark on the franchise, instead of living purely on nostalgia. Right now, Morrowind is great, but if you want to really experience Morrowind, you should play TES III. Similarly, Oblivion is a better Cyrodiil experience even though the PvP in Imperial City is wonderful. But here, the developers have the opportunity to develop a story that says, “If you really want to experience Black Marsh and Argonian culture, you should play ESO.” Here’s to hoping they do just that. Not sure if you’re aware of the lore regarding the Hist’s relation to a certain tree in Skyrim that dispenses Sleeping Tree Sap, but it’s very interesting stuff. The following lore vid tells some deep, tangential tales about the Hist.